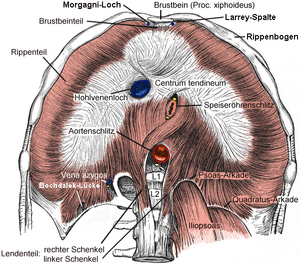 The sternocostal triangle or foramina of Morgagni are small zones lying between the costal and sternal attachments of the thoracic diaphragm. Important vessels that pass through these bilateral foramina include the superior epigastric arteries as terminations of the internal thoracic arteries, with accompanying veins and lymphatics. Also known as sternocostal hiatus or (Larrey's) triangle. It is named for Giovanni Battista Morgagni. It can be a site of Morgagni's hernia. ↑ Griffiths, E. A.; Ellis, A.; Mohamed, A.; Tam, E.; Ball, C. S. (5 November 2010). "Surgical treatment of a Morgagni hernia causing intermittent gastric outlet obstruction". Case Reports. 2010 (nov04 1): bcr0120102608–bcr0120102608. doi:10.1136/bcr.01.2010.2608. ↑ synd/293 at Who Named It?